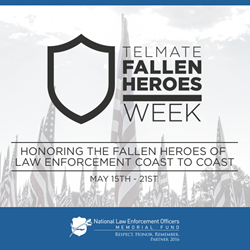 A proud partner of the National Law Enforcement Officers Memorial Fund (NLEOMF), corrections technology leader Telmate is launching its first-ever Telmate Fallen Heroes Week. The event is part of the company’s Telmate Cares program and will honor fallen officers coast-to-coast during National Police Week, which takes place May 15th - 21st. We look forward to working together to highlight the service and sacrifice our peace officers make to protect our communities. With their shared mission — of honoring law enforcement officers who have fallen in the line of duty — it only seemed fitting that NLEOMF and Telmate join forces to honor those that have paid the ultimate sacrifice for the safety and protection others. EAST: Recipient’s family has requested to remain anonymous. As a trusted communication technology partner for correctional facilities, Telmate has the privilege of working side-by-side with law enforcement officers across the United States. Telmate launched its Telmate Fallen Heroes Program to honor the memory of law enforcement officers who fell in the line of duty and provide financial assistance to fallen officer organizations and/or dependents (spouses, children, parents) of fallen officers. For more information on each of the Fallen Heroes honored during the Telmate Fallen Heroes week and to learn more about Telmate’s partnership with NLEOMF, please visit Telmate Fallen Heroes Week. Telmate is a leading provider of secure corrections and community corrections solutions including phone, tablet, visitation, messaging, education and entertainment content, corrections applications, investigator tools and GPS monitoring. Telmate’s cutting-edge platforms are deployed in over 300 correctional facilities in the U.S. and Canada. Telmate is headquartered in San Francisco, California, with employee presence nationwide. To find out more about Telmate, visit http://www.telmate.com. Established in 1984, the National Law Enforcement Officers Memorial Fund is a private non-profit organization dedicated to telling the story of American law enforcement and making it safer for those who serve. The Memorial Fund maintains the National Law Enforcement Officers Memorial in Washington, DC, which contains the names of more than 20,000 officers who have died in the line of duty throughout U.S. history. The Memorial Fund is now begun construction of the National Law Enforcement Museum, which will tell the story of American law enforcement through high-tech, interactive exhibitions, historical artifacts and extensive educational programming. For more information, visit http://www.LawMemorial.org.